Rotterdam Mid-Brabant combines the strength of Europe’s no. 1 container port with the inviting, innovative business climate of one of the continent’s most important logistics top regions. Through one single, integrated supply chain we give you a head start towards all your customers. Why choose the gateway Rotterdam Mid-Brabant? In Rotterdam Mid-Brabant, speed, reliability and flexibility are combined with a strong pro-entrepreneurial attitude, tons of knowhow, a young, talented labour force and an involved, forward-thinking government. 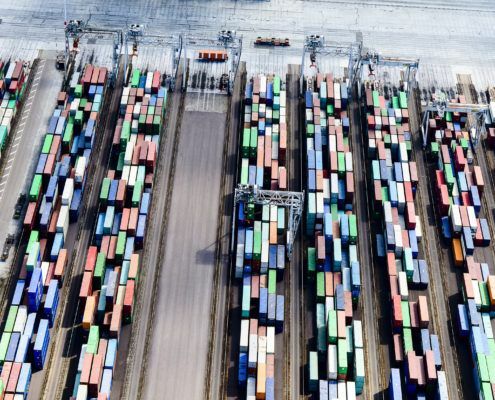 Whether your cargo travels by deep-sea ship via Rotterdam or uses the direct rail connection with China: once unloaded your container is already virtually at the warehouse in Mid-Brabant (and vice versa). From here, you can reach almost the entire European market within 24 hours. The Netherlands is the undisputed gateway to Europe. Well-known for its political stability, quality of life, inviting business climate and state-of-the-art logistics infrastructure. 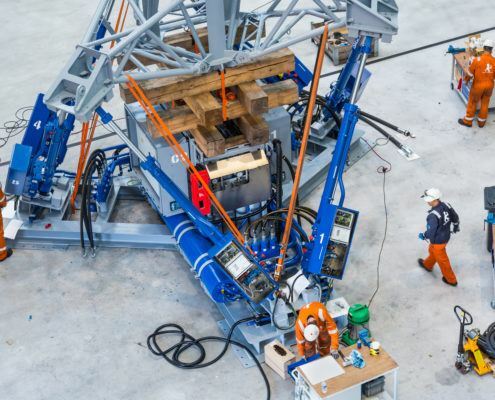 In the port of Rotterdam, fully automated container terminals guarantee optimum efficiency. These terminals offer 24/7 access to the very largest container vessels of 20,000 TEU and beyond. The port of Rotterdam is Europe’s preferred first and last port of call. This results in a shorter transit time of two to five days to your final destination compared to other ports. Obviously, this stands for both import and export cargo. What’s more, Rotterdam Mid-Brabant is directly connected with China by rail via the Chengdu-Tilburg-Rotterdam-Express. Our integrated logistics chain gives you a head start towards your European customer! The route via Rotterdam Mid-Brabant offers the quickest access to the European market (and vice versa). Centrally located in Europe’s economic heartland, transport is always easy. The inland barges, train and truck connections offer a highly efficient multimodal conveyor belt. From the deep-sea vessel, containers can be at one of the many warehouses and fulfilment centres the very same day. At arrival there, we take care of your Customs formalities. 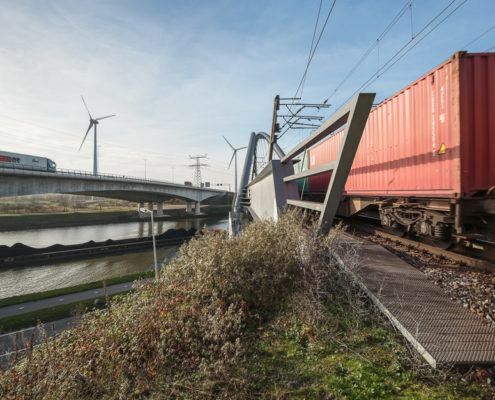 Five inland terminals strategically situated in Mid-Brabant create optimal efficiency for the sustainable use of inland shipping and rail. All this results in a fast and efficient mulimodal logistics chain. Rotterdam Mid-Brabant and China are also quickly and directly connected by rail through the Chengdu-Tilburg-Rotterdam Express. The transit time of this land connection is only 15 days in both directions. This makes the Chengdu-Tilburg-Rotterdam Express an attractive alternative to both maritime shipping (2 to 3 times faster) and to air freight (only a quarter of the costs). 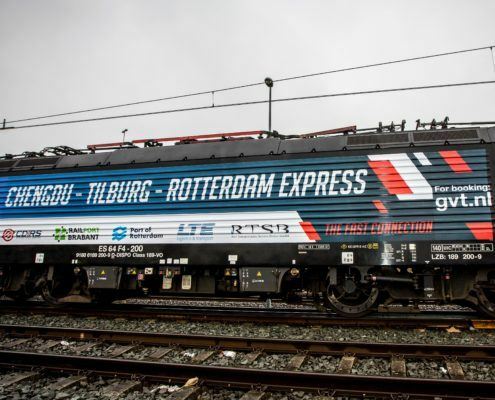 The Chengdu-Tilburg-Rotterdam Express is operated by Railport Brabant; an initiative of the GVT Group of Logistics. Many global players in high-tech and fashion use Mid-Brabant’s cities of Tilburg and Waalwijk as their European footholds. 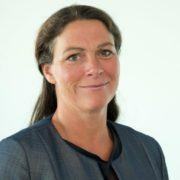 Thus, innovative clusters of value-adding logistics and e-fulfilment have emerged, surrounded by numerous versatile service providers in ICT and logistics innovation, especially also in combination with the port of Rotterdam. Companies benefit from integrated logistics chains, with optimal transparency from port to warehouse and from warehouse to end customer. 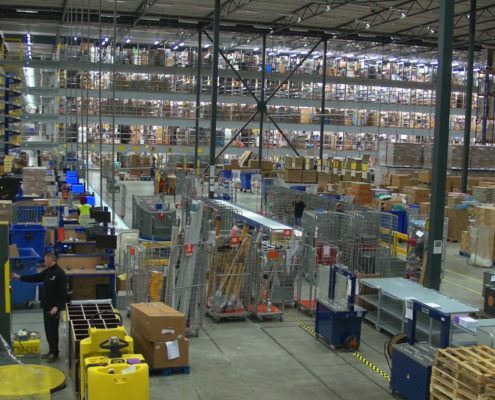 In Rotterdam Mid-Brabant, logistics innovations are given all the room they need to prove themselves. Smart software is the key to achieve logistics perfection. Digitisation is considered a golden opportunity for providing future additional value to any party looking to optimise their logistics process efficiently in order to serve their European customer. In Rotterdam Mid-Brabant, start-ups can count on a warm welcome and young potentials are actively stimulated to propose next ideas for creating chain visibility and optimisation. New joint initiatives offer real-time insight into your cargo flows and make each logistics chain optimally manageable. Rotterdam Mid-Brabant offers plenty of room for growth. 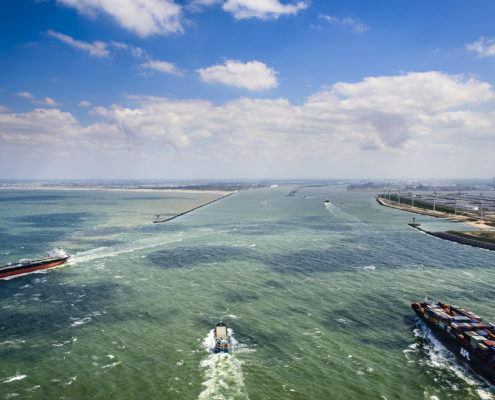 In the port of Rotterdam, in terms of connectivity and in the Mid-Brabant region to settle up your operations. 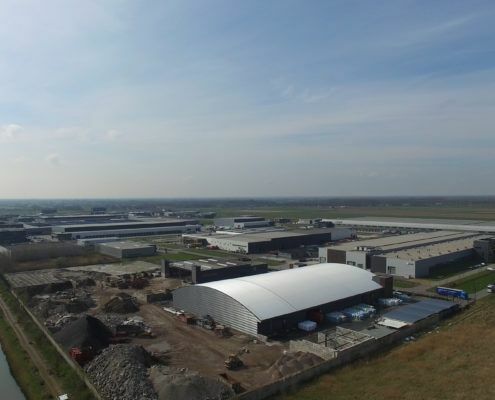 Directly adjacent to the current surface in use for warehousing, distribution and value added logistics more than 250 ha are free available for new greenfield initiatives. Everything in Mid-Brabant exudes logistics. This also applies to the labour market. At every level, well-trained, flexibly deployable staff is at hand. Trade unions generally tend to be cooperative. Education is innovation-oriented and geared to daily practice. Local, highly rated educational institutions ensure a constant influx of new talent, in line with your needs and requirements. Anyone who wants to invest in Rotterdam Mid-Brabant can count on the cooperation of a pro-active, business-minded government. Whether it’s selecting the right logistics chain partners, the best location, quickly organising permits or smoothly going through procedures. In our closely collaborating network, you always have one central point of contact. About one hundred international companies have now already established their European operations in Mid-Brabant. Directly themselves or by using renowned logistics service providers. DHL, XPO Logistics, Ingram Micro, DB Schenker, Kuehne + Nagel, CEVA Logistics, Panalpina, Rhenus, Expeditors and Pantos are just some of the specialists present here. Fuji, Dell, Tesla, Ericsson, Samsung, H&M, Björn Borg, Coca-Cola … They have all experienced how the logistics cluster advantages of Rotterdam Mid-Brabant give them a head start towards their European customers. Or, vice versa, from Europe to destinations all over the world. 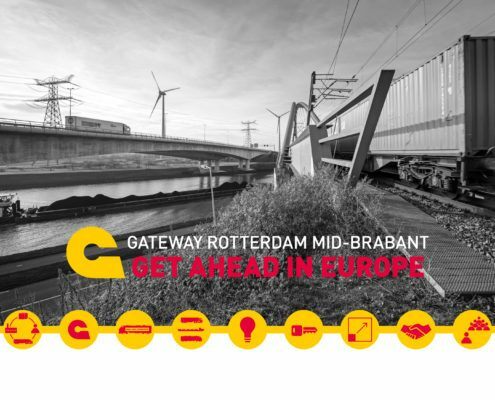 Choose the Gateway Rotterdam Mid-Brabant! 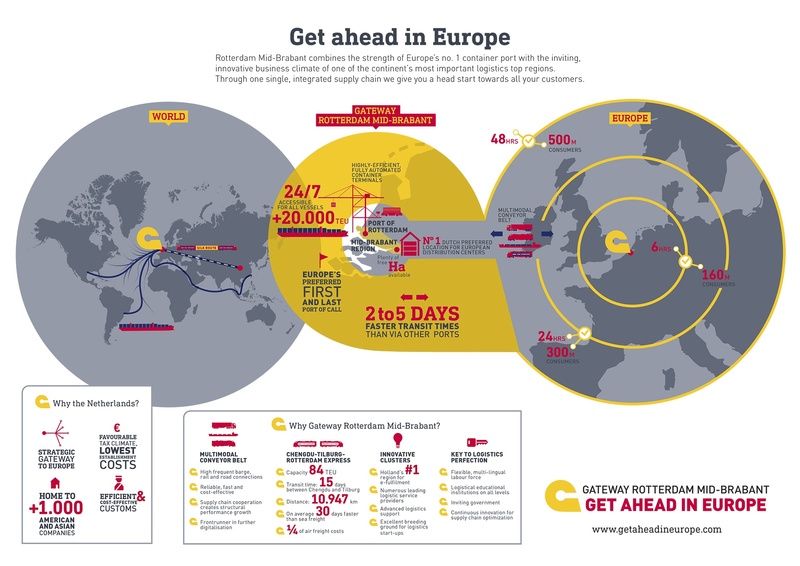 This infographic clearly shows you why Rotterdam Mid-Brabant is always your logical gateway, both for importing to and exporting from the European market. We cordially invite logistics service providers, project developers and other organisations to join the common campaign ‘Get ahead in Europe’. You can freely use the following downloads in your presentations, advertisements, etc. 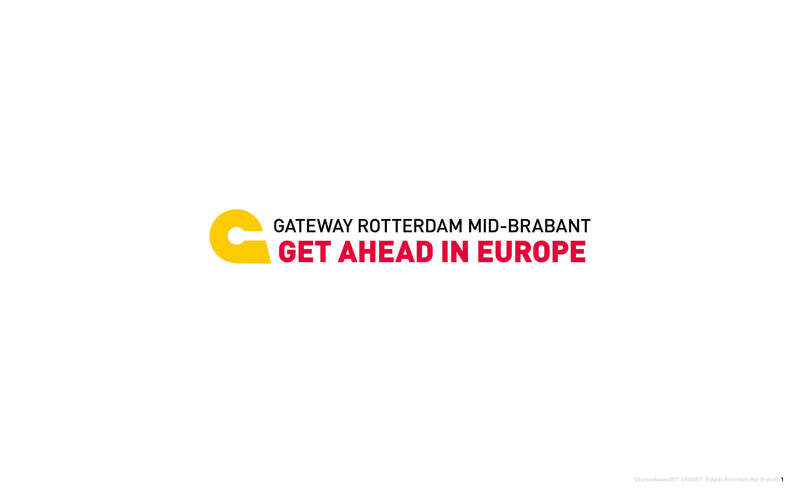 Want to know how the gateway Rotterdam Mid-Brabant can also give you a head start in Europe? Our local experts will gladly assist you. They are at your disposal, free of charge, for advice on matters pertaining to logistics, site and/or partner selection, recruitment, questions about rules & regulations, tax incentives and business premises or for help with such matters as business development.